Vinegar is a staple in almost every household. Aside from adding flavor to your food, it also has several other uses. 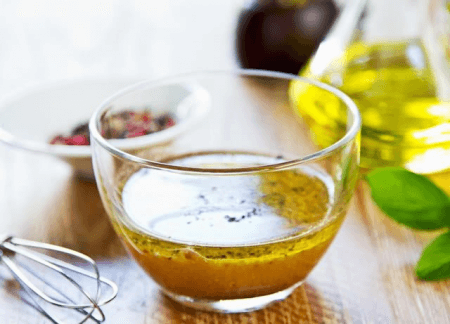 However, we also come across the term “vinaigrette” in cooking shows, cook books and websites, which leads us to wonder, “Are they the same?” This article will discuss the difference between vinegar and vinaigrette. Vinegar is a liquid matter usually composed of water, some flavorings, and acetic acid which is produced by fermentation. Commercial vinegar is produced by a fast fermentation process and is made in less than 24 hours. Traditional vinegar is made by slow fermentation that can last for months up to a year. Vinegar is used as a condiment and as an ingredient in cooking, making sauces, pickling fruits and vegetables, and making vinaigrettes and other salad dressings. Aside from being a staple in the kitchen, it is also known as an environment-friendly cleaning agent and disinfectant, and is even used in households to clear clogs, polish silver and brass, remove wallpaper and clean dirty mirrors and windows. It is also believed to have a medicinal purpose and is used as an herbicide. It has several varieties like cane, apple cider, coconut, balsamic, white and wine vinegar. On the other hand, a vinaigrette is a combination of oil, salt, herbs, spices and vinegar. Depending on your preference, olive oil, soybean oil, or even sunflower oil can be used. For the vinegar, balsamic vinegar and apple cider vinegar are most commonly used in vinaigrettes. Some people use lemon juice instead of vinegar. Other ingredients like garlic, chili peppers, onions, tomatoes, nuts and maple syrup can also be added depending on your taste. Usually, 3 parts oil and 1 part vinegar are combined and whisked until the mixture forms an emulsion. Just like the ingredients, the proportion of the vinegar and oil can be modified depending on your style. Vinaigrette is used as salad dressing and also to marinate meat before cooking. What, then, is the difference between vinegar and vinaigrette? Vinegar is a combination of water, acetic acid and some flavorings, while vinaigrette is a combination of vinegar (or lemon juice), oil, herbs, spices and other ingredients depending on your preference. Moreover, vinegar is used as a condiment or as an ingredient in cooking: making sauces, vinaigrettes and other salad dressings or processing pickled fruits and vegetables. On the other hand, vinaigrette is used as a salad dressing and sometimes as a marinade. Due to its acetic acid content, vinegar is also used as a cleaning and disinfectant agent. It also used as a herbicide and is believed to have a medicinal purpose. On the contrary, although vinaigrette contains vinegar that has cleaning properties, it is not used for disinfecting and cleaning because it contains oil, herbs and spices as well as vinegar.